This happened because the estimate might not be in its final form and the system attempts to deter you from handing it to your customer. Estimates have several useful functionalities that we'll discuss in this article. When an estimate is in an "Issued" state, this means that it is official and ready to be sent to your client. As soon as your client accepts the estimate, you have the ability to convert it into an Invoice by the press of a button. 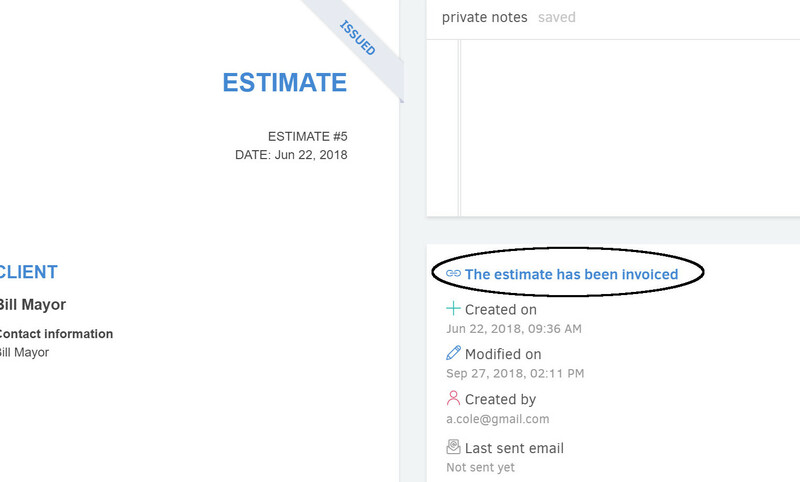 From the estimate's preview page, select "(...)-> Create Invoice" and Elorus will automatically create the related document, according to the default document type you have chosen for the sales documents (Invoice, Receipt etc). The sales document will be then found inside the "Invoices" page, in a draft state, so you can edit it or send it via email. Finally, observe how "the estimate has been invoiced" appears as a link on the document issuing information. By pressing it, you are being transferred to the invoice's preview page, to save time. 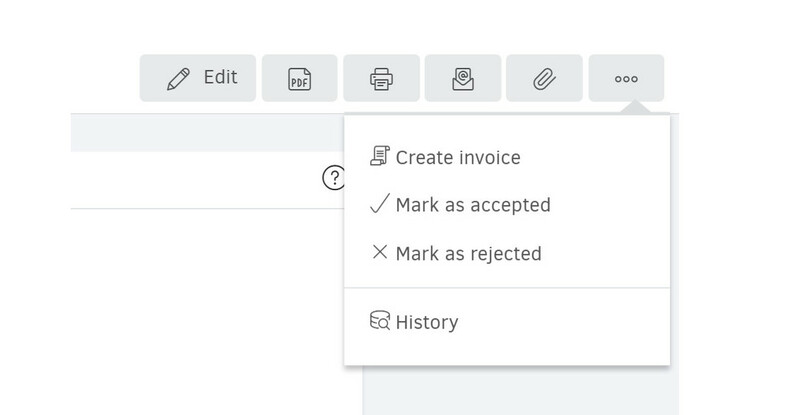 Νote: You can easily create Shipping notes and Proforma invoices via the Estimates menu. Click here for instructions. Inside every estimate's preview page, you have the option of changing its status depending on whether the customer has accepted or rejected it. 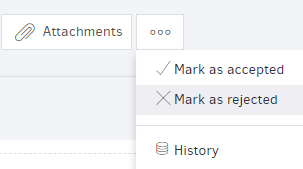 From the (...) button, provided the estimated is in "issued" state, you can select "Mark as accepted" or "Mark as rejected". Through the client portal and the permalink of each estimate, the customer has the option of rejecting or accepting it. 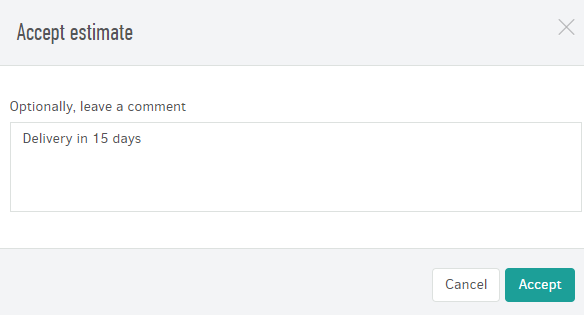 By clicking on "Accept", provided that the client agrees to the estimate, a window is displayed in which they can, optionally, leave a comment (for example, delivery in 15 days). Once they click on "Accept", the status of the estimate will change to "Accepted" and you will receive an email reading "Customer [Name] has accepted Estimate # 2. The comment was: Delivery in 15 days"
Also, in the list of estimates, you will notice that the estimate's changed status is also visible. Beyond that, you can invoice the estimate through your account and proceed with the sale as usual. If the customer has changed their mind before accepting it, you can change the estimate's status to "Rejected" through its preview page. Select (...) and click on "Mark as rejected". And in this case, if the client changes their mind, you can change the status of the estimate to "Accepted". From its preview page, click on the (...) button and select "Mark as accepted". 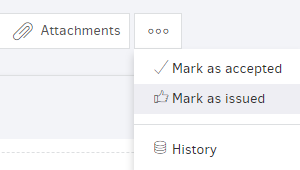 Finally, if you wish to change the status to "Issued", you can click on "Mark as issued" through the (...) button. Inside Settings -> Application settings you can choose whether a draft will be created automatically every time a client accepts an estimate online. If you wish so, choose "Yes" on the "Invoice accepted estimates" field.